Empires of History Game Series, Europe 1483 is the first medieval game in the Empires of History line of strategy board games. 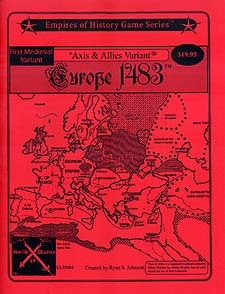 In Europe 1483, players assume control of one of sixteen different kingdoms or empires and compete for control of all of Europe, the Middle East and North Africa. Players need to make strategic alliances, be shrewd military leaders, vie for control of trade from Asia and Central Africa, and build colonies abroad. Only a combination of military prowess, diplomatic influence and alliances, and foreign trade will allow one nation to emerge as the dominant power in the region. Large 5 piece game map, over 28" x 34"
Playing pieces not included, but needed for game play. Axis and Allies pieces can be used at a push.